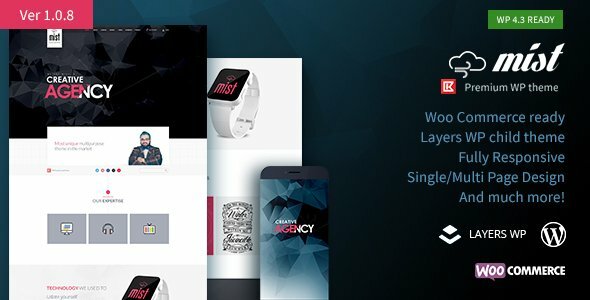 Presenting âMist | Multipurpose Layers WP Child Themeâ is a modern responsive WordPress Theme with a clean and professional design offering the ideal solution for business, portfolio, blog and marketing pages. 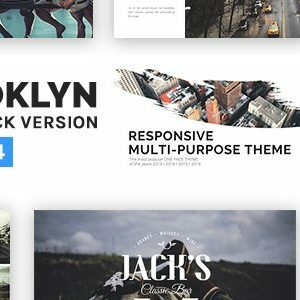 MIST WordPress comes with loads of flexible custom page builder elements.It was built in layers WP child theme with WooCommerce features. Easy colour and image selection with design settings can help you transform your website into a business selling tool. Its also flexible with a wide range of possibilities to design almost any kind of personal and professional web layouts. 1. [ New ] New Valentine preset home page demo added. 1. [ New ] New Year preset home page demo added. 1. 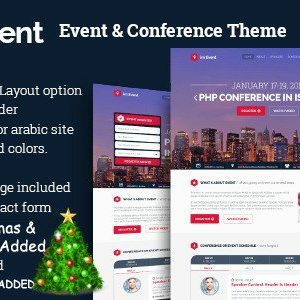 [ New ] Christmas preset home page demo added. 2. [ New ] Testimonials slider added. 3. [ New ] New footer added. 1. [ New ] Preset Layout set for the SEO Demo. 2. [Fixed] Pricing Table issue fixed. 3. [ Update ] Documentation Updated. 1. [ NEW ] Added option in the Layers Customizer to change the site accent color. 3. [ NEW ] Added option to LinkedIn link for the top section. 4. [ FIX ] Header Color change option from Layers Customizer. 1. [ New ] Preset Layout set for the APP and HEALTH Demo. 2. [ New ] Online Documentation added. 1. [ New ] Application Demo added with demo content. 2. [ New ] Health Demo added with demo content.